Phnom Penh, March 12, 2011 AKP – Cambodia and Thailand have agreed to a United Nations-sponsored meeting at the Paris headquarters of the UN Educational, Scientific and Cultural Organization (UNESCO) on May 25 to discuss ways to safeguard the Preah Vihear Temple, a World Heritage List site damaged during border clashes between the two neighboring countries, according to a UNESCO press release. The agreement follows a recent mission to Cambodia and Thailand by Koïchiro Matsuura, UNESCO’s Special Envoy for Preah Vihear, who met with the prime ministers of the two nations and other senior officials, it pointed out. Cambodia is preparing documents to submit to the meeting, said here today Cambodian Secretary of State at the Ministry of Culture and Fine Arts H.E. Chuch Phoeun, adding that Cambodia has already reported the damages of Preah Vihear Temple, but in the upcoming meeting we will focus only on important points such as how big the damages are and how to rehabilitate [the temple]. 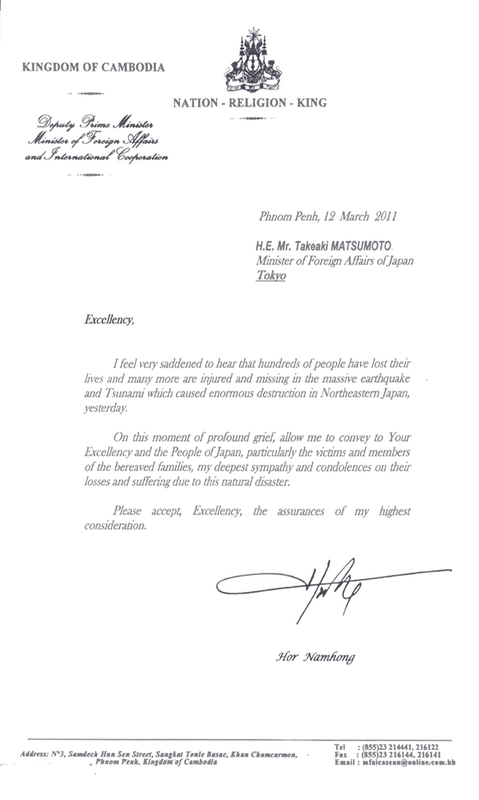 For his part, H.E. Phay Siphan, secretary of state and spokesman of the Council of Ministers said the meeting is made because the Thai side has mixed Preah Vihear Temple issue with its internal political issue. UNESCO Director-General Irina Bokova said in a statement that the main aim of the discussions on May 25 will be “further dialogue on the effective conservation of Preah Vihear,” the press release said. 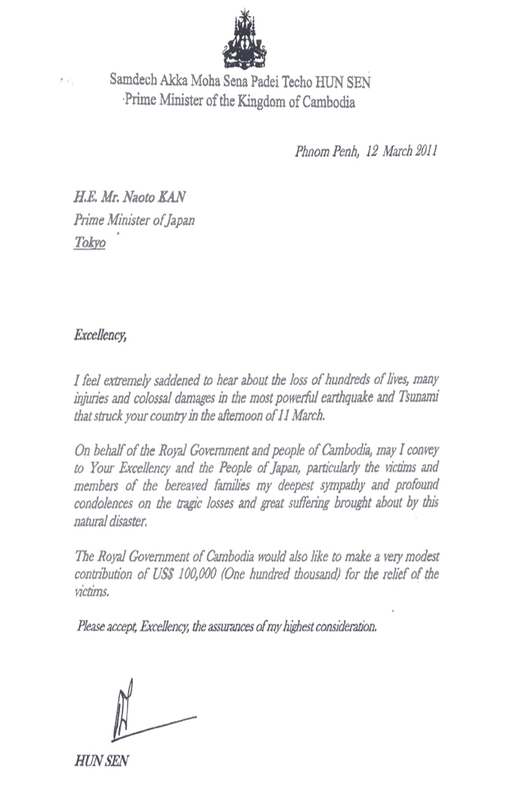 Phnom Penh, March 12,2011,AKP–Cambodian Prime Minister ‘s Letter of Condolences Over Earthquake in Japan . Phnom Penh, March 12,2011, AKP–Cambodian Foreign Minister Expressed Condolences Over Earthquake in Japan. Phnom Penh, March 12, 2011 AKP – Prime Minister Samdech Akka Moha Sena Padei Techo Hun Sen received here yesterday a visiting delegation of the Radio Voice of Vietnam (VOV) led by its General Director Mr. Vu Van Hien. In the meeting, the VOV general director told Prime Minister Samdech Techo Hun Sen of his visit, the purpose of which he said is to expand the cooperation with the Cambodian Ministry of Information, particularly the National Radio Kampuchea (RNK), Ieng Sophalet, assistant to the Cambodian premier told reporters after the meeting. Mr. Vu Van Hien said on Thursday, he handed over equipment and radio transmitter to RNK in Siem Reap province. VOV is ready to assist RNK, especially in human resource training, he affirmed. 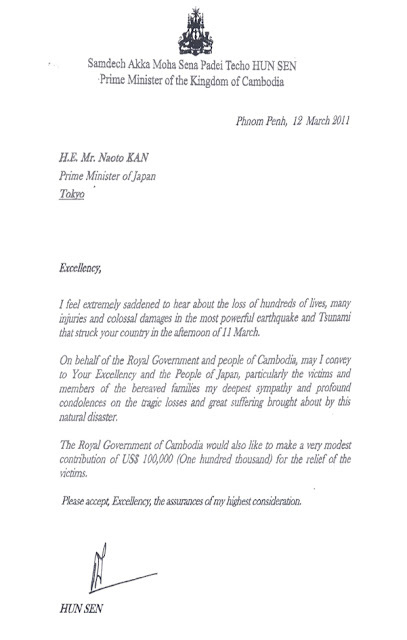 In reply, the Cambodian prime minister thanked VOV for its assistance to RNK, both in terms of techniques and human resources training. Samdech Techo Hun Sen further encouraged VOV to further consolidate and expand its cooperation with RNK and recommended RNK to do its best to take the lead in broadcasting news related to road traffic law, meteorology, etc. Phnom Penh, March 12, 2011 AKP – The ASEAN Inter-Parliamentary Assembly (AIPA) Seminar on “Accelerating the Achievement of MDG-5 through the Role of Women Parliamentarians” was wrapped up here on Friday under the presidency of First Vice President of the National Assembly H.E. Nguon Nhel. On behalf of National Assembly President Samdech Akka Moha Ponhea Chakrei Heng Samrin, President of the 32nd AIPA, H.E. Nguon Nhel praised for the success of the two-day seminar and profoundly thanked the AIPA women parliamentarian delegations for their participation in the event. Women living in developing countries experience with challenges or life’s threats during pregnancy or delivery 100 times more than women living in developed countries. Every year, there are over 500,000 women in the world lost their lives due to these issues, which is an important lost for labor force, he quoted a UN report. He further stressed that the MDG-5 can not be achieved if other MDGs are ignored. We need to double our commitment and effort on practical activities as well as on partnership strengthening in the region, particularly among the AIPA members in addition to the financial, technical and spiritual supports from the UN and international community, he said. H.E. Nguon Nhel also called for more support from the UN and all development partners in order to strengthen the capacity of parliamentarians so that they can effectively fulfill their roles. The Seminar on “Accelerating the Achievement of MDG-5 through the Role of Women Parliamentarians”, which is to rescue lives of women and children, was attended by AIPA women parliamentarians, members of the Cambodian Senate, National Assembly and government, local authority, diplomatic corps, UN’s agencies’ representatives, Asian Forum of Parliament for Population and Development (AFPPD) and civil society organizations. It is being held under the framework of the 32nd General Assembly of AIPA to be held in September 2011 and hosted by Cambodian Parliament. Phnom Penh, March 12, 2011 AKP – Cambodia’s Ministry of Environment has signed here a Memorandum of Understanding (MoU) on Green Growth Cooperation with Global Green Growth Institute of the Republic of Korea (GGGI). The MoU was inked on Mar. 10 by Environment Minister H.E. Mok Mareth and GGGI’s Chairman Han Seung-soo, who is also a special envoy of the President of South Korea Lee Myung-bak, under the witness of Deputy Prime Minster H.E. Yim Chhay Ly. Through the MoU, South Korea will help build capacity for Cambodian environment officials, increase their knowledge, provide technical assistance, and mobilize financial supports to implement the roadmap for green growth in Cambodia, according to a press release on green growth process in Cambodia. The MoU will also help ensure environmental sustainability for socio-economic development and economic growth, it added.